DAYTONA BEACH, Fla. (April 10, 2019) – AFT Events proudly announces the main sponsors for its inaugural race at Wild Sports Pass Motorsports Park in Chandler, AZ. 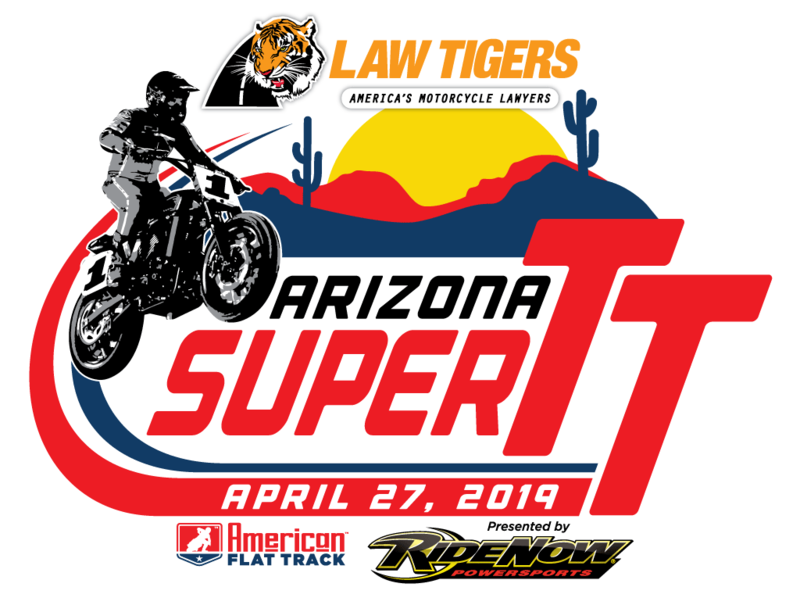 Entitlement sponsor Law Tigers Motorcycle Lawyers will be joined by presenting sponsor RideNow Powersports for the first-ever Law Tigers Arizona Super TT presented by RideNow Powersports on Saturday, April 27. Assisting thousands of injured riders since its inception, Law Tigers is committed to being the champion for injured motorcyclists in their hour of need. Founded in 2001, the Arizona-based, family-owned operation has cultivated countless relationships within the motorcycle community, one of which being its strong partnership with AFT Events. The largest powersports dealer group in the nation, RideNow Powersports has expanded from its flagship dealership in Chandler, AZ to 30 full-service dealerships nationwide. RideNow customers have access to quality products from trusted manufacturers including Polaris, Can-Am, Honda, Kawasaki, Suzuki and Yamaha, and a wide selection of motorcycles including bikes from BMW, Triumph, Ducati, Moto Guzzi, Aprilia and Royal Enfield, as well as Harley-Davidson and Indian Motorcycle at specialty RideNow dealerships. Law Tigers Motorcycle Lawyers is dedicated to making the road a safer place for every rider. As motorcycle enthusiasts and supporters, Law Tigers is committed to individuals and organizations that share this passion for motorcycle safety, awareness, and responsible riding. For more information, visit www.lawtigers.com or call 1-800-LAW-TIGERS. Born from a small Honda dealership operating out of a rented building in Chandler, Arizona in 1983, RideNow Powersports has grown into the world’s largest motorcycle and side by side dealer. RideNow Powersports operates 37 dealerships in Arizona, California, Florida, Kansas, Nevada, North Carolina, Texas & Washington, selling the powersports industry’s top products from Indian Motorcycle, BMW Motorrad, Polaris, Ducati, Can-Am, Honda, Yamaha, Suzuki, Kawasaki, Triumph, Ducati, KTM, Sea-Doo, Slingshot, Spyder, and Harley-Davidson. American Flat Track is the world’s premier dirt track motorcycle racing series and one of the longest-running championships in the history of motorsports. Sanctioned by AMA Pro Racing in Daytona Beach, Fla., the series is highly regarded as the most competitive form of dirt track motorcycle racing on the globe. For more information on American Flat Track, please visit https://www.americanflattrack.com, like us on Facebook, follow us on Twitter, check us out on Instagram, live stream the events at FansChoice.tv and catch all the American Flat Track racing action on NBCSN.